Christoph Metzelder (born November 5, 1980 in Haltern, North Rhine Westphalia, Germany) is a football defender for Borussia Dortmund. He is currently considered one of Germany's most talented defenders. In the summer of 2000, Metzelder signed for Borussia, and he was an instant success. 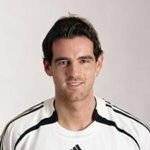 He not only won the German championships with BVB in 2002 as a regular first team player, he also reached the 2002 World Cup final with Germany. In the tournament, he was also voted the "Best Player Under The Age of 23". But despite offers from other big clubs, he extended his contract until 2005. After his long injury lay-off, fans and team-mates are now both hoping that Metzelder will be able to make a comeback next season that mirrored the start of his career four years ago. One can hardly fail to notice the main strength of the BVB skipper: With a height of 1.94 metres, Metzelder is outstanding in the air. And despite his young age, the centre back, who can also play on the right of defence, has nerves of steel and necessary combination of composure and confidence. This, along with his superb tackling skills, both in the air and on the ground, make Metzelder a very good defensive player.